We have discussed causes and types of scars. Now let us see, if we can do something to help to stop formation of scars. There are lot of conflicting opinions, myths and rumors about prevention of scars. If you know the correct way of preventing scar, you will enjoy scar free skin while doing wrong things can make your wound heal much slower and make your scar much worse. By following correct method in many cases you may prevent formation of scar completely. There are some of the simple tips to follow that may help you to prevent formation of permanent scar after suffering from skin damage. 1. Limit H2O2 (hydrogen peroxide) usage on skin: Skin is cleaned either by applying alcohol substance or hydrogen peroxide after it initial damage. Cleaning of wound by hydrogen peroxide once is sufficient but repeated use of H2O2 may kill the newly forming skin cells and slow down the process of healing. This prolonged healing process may make your scar worse n the end. After cleaning the wound with hydrogen peroxide apply an antibacterial ointment to keep the wound moist and clean to give perfect environment to heal the skin. 2. Keep the wound covered: Many people may advise you to keep the wound open to let the skin breathe but it should not be done. You should keep the wound covered in an antibacterial ointment as often as possible during initial healing stage. This will keep your wound clean and moist and give perfect environment for optimal healing. 3. Sunblock: Skin of fresh burns, wounds and fresh scars is very sensitive to sunrays, turn very red and ultimately become hyper pigmented if exposed to sun. This makes scar much more visible. To safeguard the skin from sun rays apply sun block or sunscreen on the skin burns, scars. There are many more scar prevention techniques. 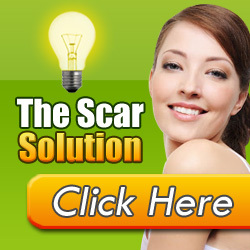 One of the resources is “The Scar Solution“ where you may find many scar prevention techniques that can keep your skin free from scars after damage. Proper early treatment of scar can shorten the healing time and makes your scars much less noticeable. If you have scar for a long time, you can still get rid of scars with proper treatment program. Reducing the visibility, fading of scars and curing in natural way are always possible but preventing it in the first place is better. Facial Scarring: Facial scarring is a very sensitive subject and requires lot of attention. In most cases scar on face are the result of removing of pimples. For removal of pimple scars undergoing an invasive procedure has its risks and may leave additional scarring behind. Applying of designer scar creams are very expensive and may not deliver the promised result. Some may advise vitamin E, onion extract, cucumber, sandalwood or olive oil, are these products are really effective in curing the scar? These products have not been proven in any scientific trials and people may achieve results for another reason. This is likely from massaging the scar on daily basis or scar might have been in the healing process. Certain types of scars respond better to certain types of treatments. One type of treatment may not cure all types of scars. It is better to incorporate moisture, heat and massage in your treatment program. For treating scars timing and techniques are most important. You can get rid of scars in natural way with right information and a little persistence. For more information about prevention of scars and natural removal of scars check out ‘The Scar Solution“. It is one of the most effective scar removal products and comes with 60 days money back guarantee and with additional eBook on acne cure as bonus.